Love Catherine's dress, the color and style are beautiful! Like the color of Maxima's dress too. I was looking forward to this event. Maxima looks wonderful, she is absolutely perfect. I didn't expect it but Kate is a disappointment for me. Her gown is pretty boring, I don't like it at all, she is so pale in this dress...and her hair...awful. She has fantastic hair, but this updo is awful, doesn't work with the tiara. It's like the tiara is just put on her head, no volume at all. I think the hairstyle always should be chosen to compliment the tiara and vice versa. So sad but this outfit didn't work for me this time. I was shocked at how thin she looks, especially for a Mom that is nursing a newborn. I think her look is very froo-froo 80’s. It’s a shame because she’s such a beautiful young woman with lovely features and great hair which was not utilized to its full potential here. Queen Maxima nailed it 100% in my opinion. Simply regal! I doubt that she is still nursing, but I do agree the dress is awful on her, and she is so very thin that I wonder if she is anorexic. I agree with you Larine, Kate was a bit of a disappointment in this occasion, at least for me; that dress made her looked old, dated; on the other hand queen Maxima was stunning head to toe just perfection. Kate looks too thin to be healthy. She doesn't look happy, either. I don't think a comment about Kate possibly being anorexic is appropriate. That is quite a serious accusation. Not all thin women have an eating disorder. It is called a stomacher. It is meant to be placed there. The Dutch Crown Jewels are jaw dropping! This is what we all love to see. Let Maxima Reign! she looks every bit her majesty. Kate looking lovely too, a color we have never seen her with evening gown. Maxima is smashing it here, beautiful dress, massive tiara and so many jewels. The Queen also looks lovely as always so does Camilla in the simple white. Catherines' dress as so much potential but of all the fabrics in all the world why taffeta! Taffeta wasn't even nice in its prime in the 80's! She can literally have any dress made and she chose this!! For once, my choice of best dressed goes to Camilla. Maxima would be ok without the addition of the diamond brooch, the woman is really given to exaggeration. @Gabriella - the 'brooch' is a stomacher in a good distance to the other items. Queen M wears the Stuart, chandeliers and that's it. So where is the exaggeration? I would like to have that explained. Really!!! Gabriella, I agree. Camilla has a very good dressmaker working for her, fitting the outfits perfectly well on her body. Maxima is absolutely stunning in the full Stuart tiara. The stomacher is amazing. Her deep teal gown shows off her national jewels perfectly. Catherine also looks lovely. I agree, gabriella. To me, stomachers (what an ugly word!) have always seemed like a bad idea because 1) they are placed unflatteringly, i.e. below the bosom, and 2) they distract from the jewels that frame the wearer's face and hair. Maxima looks fantastic, what a dress. The sheer cape thing is a bit unusual but it does make the whole look extra regal. Camilla is a close second. What a regal dress, though I would have preferred it in a different colour than white (looks a bit bridal). 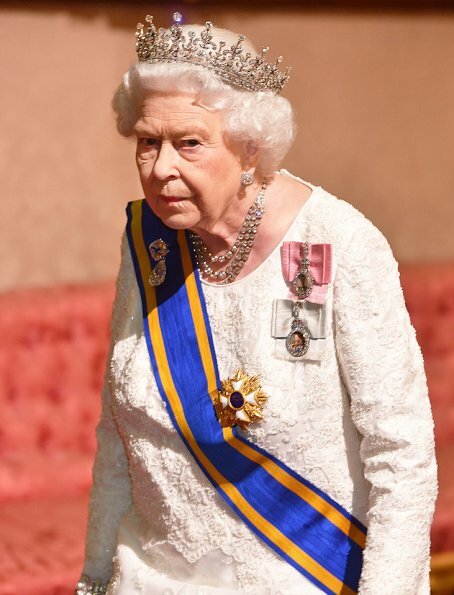 The queen looks her usual self. Kate´s dress is a huge miss for me. Looks terrible, both material and silhouette. Unpleasant 80s flashback. Teresa May would have look ok if the dress had been her size. The sleeves are weird and unflattering, but what really ruins the look is the cringeworthy tightness of her dress. Purse and shoes look random. Also, Máxima is the only lady with a regal posture. All the others slouch, and only the QE2 is forgiven because of her age. 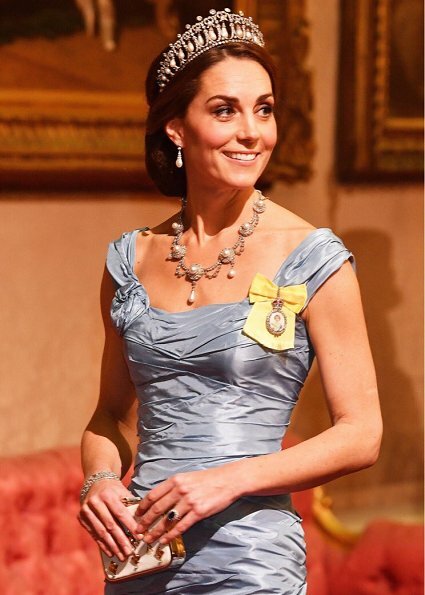 Vanessa, Duchess of Cambridge's dress is turquoise as was the color of choice for many ladies last night. It is a rich hue, although not as bold as the one of Countess of Wessex's gown. All ladies look fabulous in this color nod to their guests. Orange was obviously the other color to honor the royal family of Orange . Wow this is one of Maxima's best looks. The way the colour diffuses in and out is very flattering on her and the central bow brooch ties the whole look together nicely. I am not fond of Kate's look, the top is nice but then it's a bit messy. Maybe it looks better in real life. Yeah I'm exhausted...its been an amazing day!!! Wow, Catherine looks fantastic! This color is new for her and looks so good. The dress fits perfectly and I think the taffeta is very princess-like. Her crown is such a nice nod to Diana and her upsweep compliments the crown so well. Maxima's dress color is very deep and rich looking, perfect for fall. The fabric is dreamy, not crazy about the sleeves, but overall very nice dress. The queen regal and elegant as always!! This is the comment I share mostly. Catherine's dress is very special, fits perfectly... Her hairdo is a bit disappointing, too strict IMO. Maxima's dress is wonderful. Camilla's dress fits her perfectly but nothing special, and Teresa May is just insignificant. Wow, I usually don't like maximas style and live Kates but this time is all around, thanks for the treat for the eyes!! Just had to add--Wasn't it wonderful to see Princess Mabel at the State Banquet? Mabel was present at the banquet! There seems to be too much lighting or glare as they are walking from the reception to the dinner. Everyone was enjoying the earlier visit, what happened, why are Charles and Camilla glum at the table? 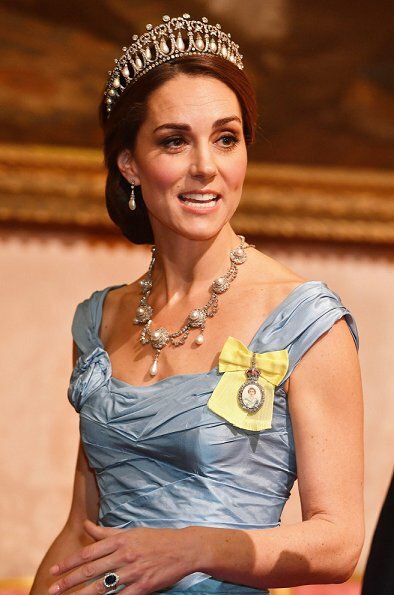 I see Catherine wearing the pearl drop tiara, is it time to rein her in, maybe she should have worn a different tiara. 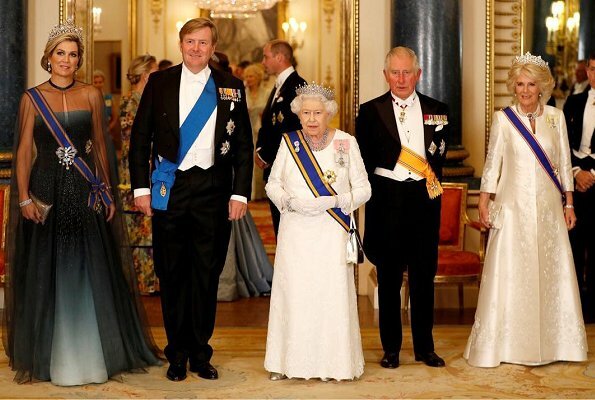 Queen Elizabeth looks great, Maxima is stunning, Camilla w/understated elegance again, and Catherine's dress...that thigh hugging style I never liked and the necklace and the tiara don't seem to go well together, or the photo isn't a good angle. Utterly gorgeous gowns on Kate and Maxima, really superb. Camilla's gown is nearly identical to the magnificent dress she wore for her religious ceremony with Prince Charles -- however, I do not like it in bright white -- particularly on an occasion at which Queen Elizabeth is wearing white! Jane Chantal, I agree with you about the way both royal ladies look superb. White was one of the three Dutch national colors ( look at the flag: Orange, White, Blue) that were suggested to all ladies present as far as their color choice was concerned. As it is a long standing tradition at the British court to honor their guests. I'll say it again: HRH Catherine, Duchess of Cambridge's dress is in bold turquoise. Someone's camera lens wasn't smart enough to adjust the burn from flash. This pale nonsense is NOT the color of the lavish, color changing silk taffeta she wore. The color was close to the hue of Countess of Wessex's gown: blue towards turquoise, the Dutch blue, if you will. I love Queen Maxima's "ombré" gown and the stunning Stewart jewels. Prime Minister's gown is everything but boring. Superb design. The black glitters just enough to give you sudden surprise without being too much. The dress is deep blue, the black segment runs along its side as well. Badly done photos can make or destroy any dress in the world. Oh no not a taffeta gown! That fabric should have stayed in the 80's. Kate's dress reminds me of those awful prom dresses. Catherine’s dress is actually incredibly sensual with its deliberate and planned ruching. She looks good in pearls for days. Queen maxima looks amazing but somehow the sheer cape wasn’t to my liking. The tiara though. The queen and the Duchess of Cornwall look very sparkly, elegant and nice. Maxima looks stunning and regal. Oh Máxima you did it again!! What a fantastic dress, love the gradation of the color, the low cleavage perfectly insinuated with the shear cape, the hair and tiara are just majestic, and of course she is wearing all the heavy artillery, that's how she rolls. I don't particularly like Camilla's outfit, too bridal. Kate's dress it's a huge disappointment, I can honestly say, that I have never seen her wear a truly ugly dress until today. Maxima really knows how to wear such wondeful tiara, her appearance is wonderful and royally, and Kate doesn't stay much behind her, she wears georgeous jewellery and dress in beautiful blue colour, but unfotunatly this dress makes her body long and a bit shapeless. Kate extra fabric for so thin.Does not have stylist?Is not nice to see.The queen imprcable and Maxima too. Camilla by far the most elegant and best dressed. I like Maxima's dress, beautiful color, but as usual she's way over the top with too much jewelry, but her hair looks good. I'm underwhelmed by Catherine's choice of dress. In my opinion, as Queen of the Netherlands Maxima can show all her extraordinary jewels. Who else can wear such jewels, than a Queen? @Katharina - I am with you, well said! Maxima is a real style queen. She has her own very distinctive style, very bold which suits her tall, straight and sparkling entity. This out fit in whole is a good example. Camilla looks very good with this dress, even she has her own strong sense of style. And QE is QE, looks ok for her age. Catherine looks pale and absolutely too thin. Unfortunately this dress underlines it. I hope she is ok, it takes a toll to have three kids at short notice. 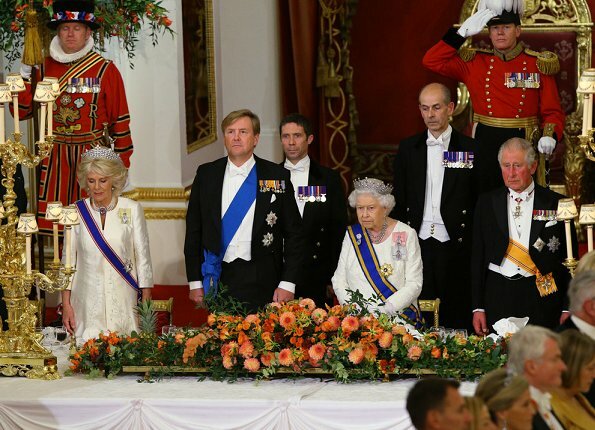 So euphoric that Maxima wears the Stuart Tiara. Yes, she looks stunning and regal. Catherine looks thin and in my opinion the color doesn't suit her. It's the first time Catherine wears the family order. Pretty nice to see. Are there any pictures of princess Mabel? I've heard she was also a guest at the state banquet. Ohhh, so much to comment on here.. Maxima looks stunning, extremely regal. But the sash against skin, is that not a big no-no? And Although extremely impressive, I would have dropped the brooch. The Queen E is majestic, as usual. Lovely in white, and so is Camilla. Now Catherine... My first impression was that she is not only wearing the tiara that Diana used to wear, but also one of her old evening dresses... However, the more I look at it, the more I like it. I will have to think again. Love the pearl necklace. Maxima is realy WOW! Simply amazing and stunning! Yes Jane Chantal, I have to agree, if Camilla's gown could've been in another colour, but the 1st time she had it on, was to the opening of parliament, and it look's like all the ladies, ladies-in-waiting also, put on white gowns for this event. 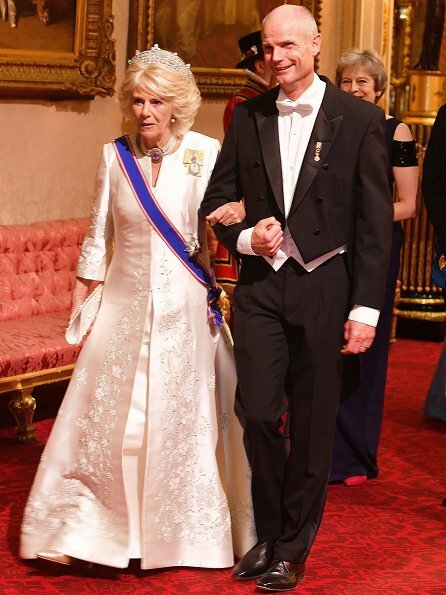 And this is the 3rd time, Camilla's got this dress on, which is fantastic, because it's stunning, and she get's the "money worth," out of the dress. And Blair, I also agree Kate's bottom part of the dress is full of wrinkles, because it's taffeta. 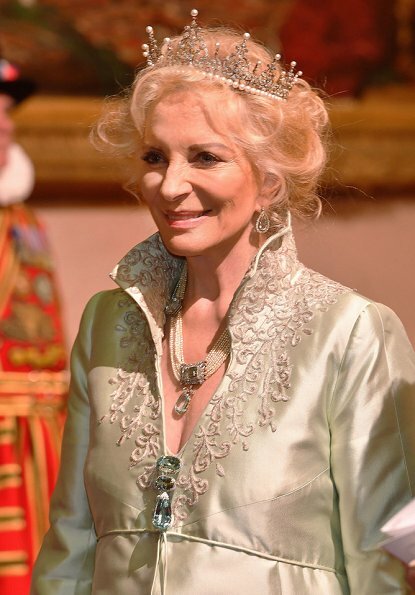 Also princess Michael of Kent looks stunning, with the pearls attached to her tiara, and the "pearl choker. Wow!! Very true that Camilla's gown was a perfect choice for the State Opening of Parliament. Queen Maxima looks magnificent .What great tiaras we can see? all the royal ladies are wearing massive tiaras .Kate dress is beautiful for me .Camilla is doing her best wearing a dress looks the same with her wedding dress but in white and a large tiara. Ik ben bijna blind van al die glitter, ik zie dat zo graag. Iedereen ziet er mooi uit met Maxima voorop. Camilla is altijd mooi gekleed. Kate s kleed iets te ingewikkeld. Mr May s kleed is veel te klein, helemaal niet mooi. 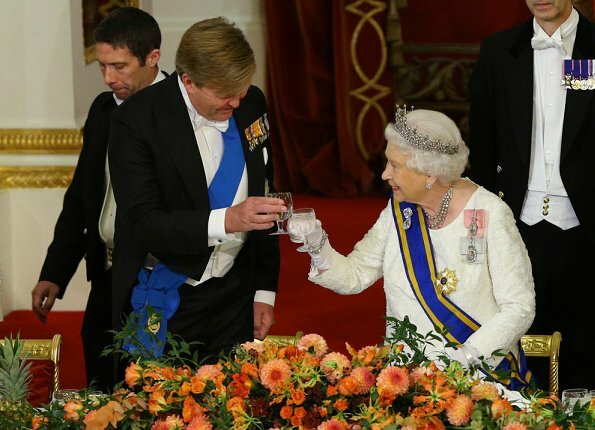 Al die tiara s en juwelen, zo mooi. Maxima looks absolutely stunning...dress - makeup - hair - tiara - brooch... everything about this look was perfect. So beautiful and regal. Its wonderful to see all ladies with big tiaras. WWowww, what a treat! 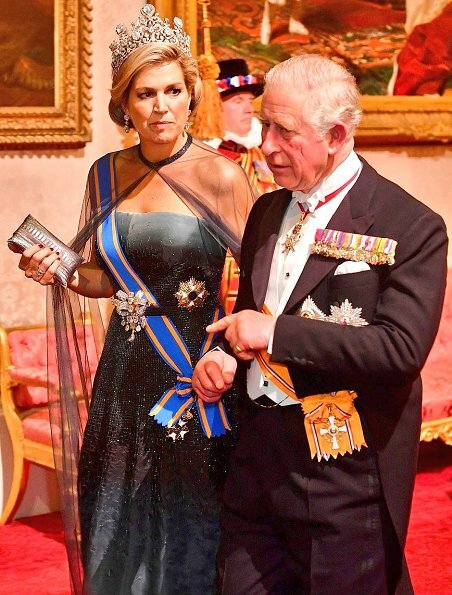 Queen Maxima at her absolute best...not only the "big gun" tiara, but that stomacher... WOW; WOW; WOW!!! All the ladies look very good - with one exception, this is the flowerprinted (orange, blue, green, yellow...) in picture number 12 (i don't know who the Lady is). This Dress Looks like it is for carnival. Maxima and Catherine both are beautiful. One must be very Slim to wear the dress Catherine is wearing here. But I agree that she looks even a bit too slim. She looks healthier when she is not so slim. Thank you for the information, Anonymous! Maxima's tiara is so stunning. Agree with some of the comments on Kate. She should put some weight on. She is pretty but i think she looks older now. I think she is the prettiest during her pregnancy days. Catherine looks absolutely fabulous! A regal princess. Her jewellery is perfect with the soft blue color of her dress. Not a fan of Maxima but she did look great here, The Queen and Camilla as usual in white. Princess Mabel's flower printed dress was not flattering. NO, she don't look regal in this 80's barbie dress. She could look sooo much better. I fully agree with Anon 4,51! Catherine is fabulous in a wonderfully designed dres!! 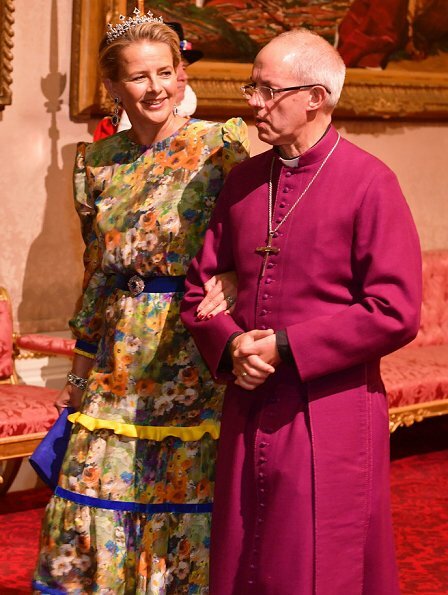 I'm surprised that so many commenters consider Catherine's gown a throwback to the 1980s. My recollection of '80s evening gowns and prom gowns is of full skirts, pouffy sleeves and lots of ruffles -- more of a ballgown look. That can be very pretty (if not overdone), but Kate's dress here certainly is not of that type. Jane Chantal, if you are hopeless, so am I. Taffeta is a wonderful fabric for evening gowns! I agree with both of you. The 80s were a time of exaggeration. Kate's gown is not the 80s I recall. And we need to keep in mind that the 80s are coming back, for better or worse. Everyone decked out to the hilt. Love Maximas Tiara. Everyone looks grand. Must say Camilla and Catherine stick out very nice dresses. C now has the Family- Order, very nice. One would never believe Catherine is a mother of 3. Well, this may very well be one of the glitziest events we’ll see in a while. Everyone brought out their heavy artillery. No holdbacks. Excellent show of royal jewelry and heavyweight ball gowns. Easily Maxima with her Stuart tiara, eating sand stomacher, combined with the majestic dress, wins the day. She wears it all so well and such amazing confidence, that the others (the Queen excepted) looks like they at trying hard to play the part. Camilla is fine, she is catching up with the role and given how hard she works at her age, she has now been embraced by the family. Still looks like she’s trying, not necessarily belonging. It’ll always be the case, probably. Catherine... I am now sure if she’s tired, concerned or something else is putting a veil on her face. The dress isn’t great, but in my opinion way better than the one she wore at the State Dinner for the Spanish royals. That was an awful dress. This one at least doesn’t wear her down. It’s certainly 80s prom dress, but that’s the current style as well. Taffeta was never my favourite fabric (regardless how trendy). The Trumpet dress (technically not a mermaid dress, given where the cut of the train beggins) shows her silhouette very well and (whilst many of us think she’s too thin for her own good) I must command her ability to loose weight so quickly. The colour is not helping in brightening up the overall tired-looking impression. Nor does all the bling. Also, we are to understand that she her the Royal Family Order since Dec and did wear it at the Diplomatic Dinner last year. The Duchess of Cambridge appears to be wearing a royal order. If we look at the pictures of Catherine's visit to Museum recently, it becomes obviuos that she is not too thin, it's just the angle of the pictures. We do not see her full front, and at the 2/3 angle even Camilla looks very slim, as you can see on the sixth picture. The color of Catherine's dress is not as pale as it looks - you have to bear in mind that there's no studio light, and all the colors, especially cold ones, look paler than they really are. The even like that one demands dressy outfits in a classic , maybe slightly old-fashioned style which is usually favoured by the British royals. You wouldn't call the Quenn's or Camilla's dresses pretty or stunning, it is the jewellry which is supposed to be stunning and over the top. The current Dutch royals wear different outfits, that is why Princess Mabel's outfit doesn't seem dressy enough for a tiara. 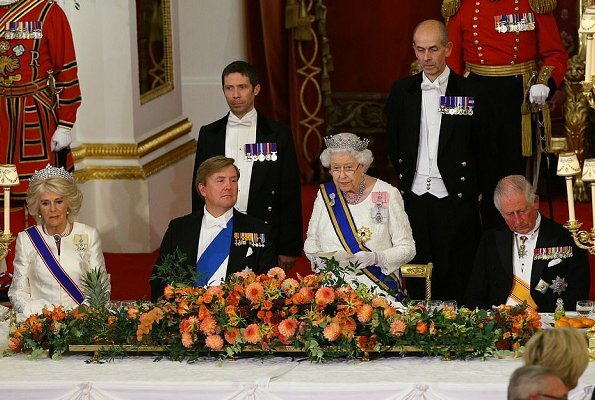 Ex-Queen Beatrix would have had something classic and slightly boring with egg-size diamonds for the occasion. Well, there we have it: all the royal splendor. I am surprised at the overtly sparkly show, these days monarchies try to send a carefully managed message of "we are like everyone else" - and this show off certainly doesn't go in that direction. Splendid show it is though - no argument here. But it feels just that: a show. Maxima wins the day - by all accounts. Excluding Her Majesty Queen Elisabeth, the other ladies could learn a thing or two from her. Including posture (like someone pointed out). Camilla is consistent at least - exactly what one would have expected (and bonus points for recycling an outfit - at least its 3rd viewing). The image I see when I look at Kate's photo is that of a period drama. Some costume design with lots of bling. And the actress who tries to play the part. She may still need some time to mature in the role. Certainly she lost quite a bit of weight and the dress is showing it. Whether she's too thin or not - debatable; but that is certainly her choice. And whilst indeed, the British Royals prefer a rather dull style - Kate has done better with that red Jenny Packham or even the lilac McQueen before it. I doubt anyone in the family made her choose this particularly old fashioned and dull taffeta dress. Also, she looks very tired (the light is tha same for all of them, so it can't be the reason Kate looks this way. I still like Catherine's dress and think it suits her very well. I agree with Anonymous at 9 that it is a huge improvement on the one she wore at the Spanish state banquet which was a total washout next to Letizia's glorious red. 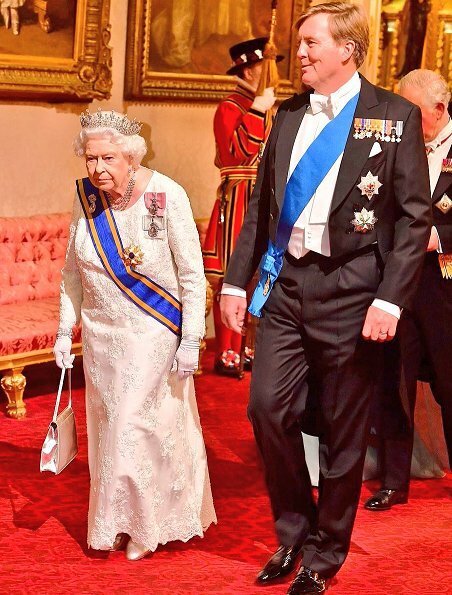 I wonder if after her own fabulous red gown at her debut state banquet, if she was asked to wear something less showy so as not to detract from the guests of honour? I also think that the reason that they may look glum is that they are all walking in and chatting, generally to people they don't know especially well, as opposed to posing for photos. Maxima and Queen Elizabeth look superb, I also like Camilla's dress. Mabel is faithful to her style - not my taste at all but very her and it's nice to see her there. Princess Michael also knows how to dress for such an affair. I like Catherine's dress on closer examination but don't like her hair especially here. Agree she seems a bit tired - not surprising with 3 young young children, even with help. For me Princess Michael was stunning . Who is the designer of Maxima's gown?